Freestanding ranges are designed to fit anywhere in your kitchen. They have finished sides, so they don't have to be surrounded by cabinets. They can be installed as an "end cap" to a line of cabinets or on their own with both sides open. The controls are located at the rear on a backguard. Some models place the burner controls on the front of the cooktop surface or above the oven handle while keeping the oven controls on the backguard, while others place all of the control options on the backguard. The freestanding range style tends to have a lower purchase price than slide in models. There are many different feature packages available for both gas and electric free standing ranges. Electric freestanding models start at around $400 for the most basic feature packages (and are usually coil top models), with mid-range models starting at around $700. Gas freestanding models also start at around $400 and mid-range models start at around $800. The rear control panel present on most free standing ranges is usually 7-9 inches tall. This will break up any backsplash tile design behind the range, and won't allow you to install the range into a kitchen island or peninsula. The design also means that you will have to reach over pans and hot burners to adjust temperatures and control other features of the range. However, there are some free standing "hybrid" models available with controls placed on the front of the cooktop area. They look like slide in models but have finished sides, and are usually higher-end models. 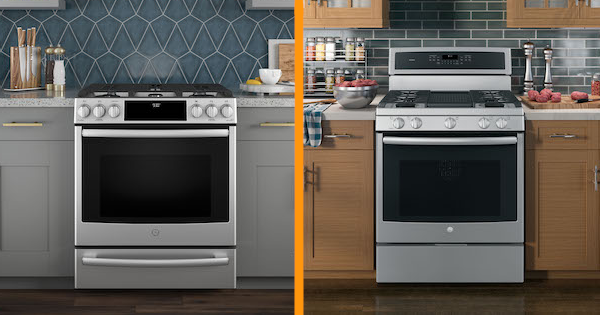 Click the links below for a full list of freestanding ranges available from top brands like Frigidaire, Electrolux, KitchenAid, LG, Samsung, GE and others in Electric or Gas options. Slide-in ranges are designed to fit in an opening between cabinets in the kitchen for a high-end, built-in design. They are usually slightly higher in price due to their built-in design, but they give a different look that is very desirable. The controls are conveniently located in the front, eliminating the need to reach over hot burners to set or adjust the controls in the rear. There is no control panel in the rear, making the top completely flat. The top is usually designed to slightly overlap the countertop, so there's no gap for drips or crumbs to fall into. Slide-in ranges can be installed in islands and peninsulas in your kitchen, giving you more flexibility in your design. They also work well with custom countertop materials and designer backsplashes. These ranges are available with all of the latest features, such as dual fuel, but the ovens are usually slightly smaller than the ovens in free standing ranges. When this article was initially written a couple of years ago, many slide in ranges required filler pieces set behind the range, about 1-2 inches wide, that either matched your countertop or the stove's finish. Today, the vast majority of slide in ranges are full-depth models that don't require adjustments like filler pieces. The only issue is the height of the countertops for slide-ins that overlap the counter on either side. The premium look and installation options alone may make you consider purchasing a slide-in for your home. Electric slide in ranges start at around $1,100, while gas models start at around $1,300. In general, you can expect to pay at least $100-200 extra for a slide in model versus a comparable freestanding model, but it can be $500 or more for a high-end model. Click the links below for a full list of slide in ranges available from top brands like Frigidaire, Electrolux, KitchenAid, LG, Samsung, GE and others in Electric or Gas options. When considering replacing one type of range for another, you no longer need to consider the filler piece for slide-in models as a factor. If you are replacing an old slide-in model, you may need to have any filler area behind the range removed to accommodate a full-depth model. A front control "hybrid" freestanding range may be a good option, and some manufacturers offer trim kits so the sides of the range will overlap your countertops like a slide-in model. Considering a pro range? All professional ranges have front controls. When it comes to kitchen renovation, a slide-in range offers a premium built-in look and design flexibility, especially if you want to install a range into a kitchen island or peninsula. The front controls are modern and stylish. Most appliance manufacturers offer a variety of models in both slide-in and free standing ranges. There is one in each category to fit any budget and you should look at both categories to find what is right for you. Editor's Note: This blog was originally written in February of 2016 and has been completely revamped and updated for accuracy as of the publication date noted above.